Installation can be done through a factory certified installer or an installer recommended by your local representative. For tight budgets, another great option is to organize a volunteer-build within the community with supervision provided by a certified installer. We offer a Safety Resource Series with each playground purchase that offers information about proper maintenance of your new playground, as well as suggestions for supervision that can be implemented in your community. Regularly inspect and maintain your playground equipment and its surrounding area to ensure the safety of the user. Proper maintenance of Play & Park Structures equipment includes utilizing the Playground Maintenance Checklist below to identify areas requiring repairs or replacement, and barricading the equipment to prevent use while maintenance is being performed. Check for deformation of open “S” hooks, shackles, rings, links, etc. Check “S” hooks for excessive wear, making sure they are properly closed; never reuse an “S” hook. 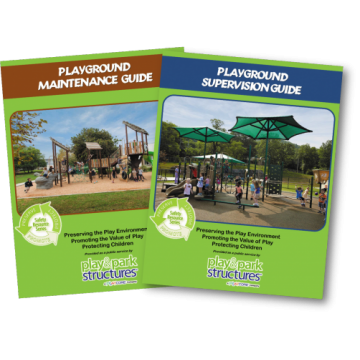 Download a copy of Play & Park Structure’s Maintenance checklist here.